What Side Dish Do You Cook Along With Brisket? Beef brisket is a traditional southern smokey barbecue treat made from the breast of the cow and slow cooked until tender and juicy. 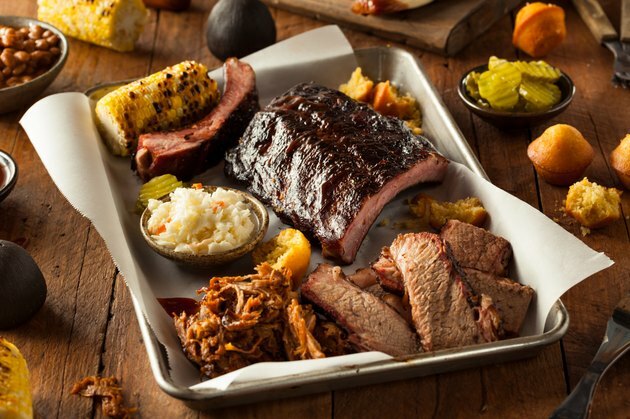 When planning a menu to accompany your brisket, consider dishes that will complement the heavy, smoky flavor of the beef while working within the barbecue theme of the meal. Creamy dishes provide contrast to the rich, smoky meat and barbecue flavors, so serve a potato salad on the side. Fresh potato salad wins out over store-bought with simple ingredients. Clean and dice one to two potatoes per person. Boil the potatoes for 20 minutes or until fork-tender. Drain well before mixing in enough low-fat mayonnaise to coat the potatoes. Add a splash or two of cider vinegar, chopped onion, pickle relish, salt, pepper and paprika. Toss lightly. Southerners know it's not a meal without the slaw, but some take their brisket and sneak it onto a bun with their slaw on top. Make coleslaw fresh and light with your own dressing. Blend 1 cup of light mayonnaise with 3 tablespoons of lemon juice and 2 tablespoons of sugar. Allow dressing to set while you finely chop one head of cabbage, one bell pepper and shred one carrot. Toss the vegetables with dressing and refrigerate. Corn is one of the healthiest traditional side dishes you will find on southern barbecue menus with 10 percent of your daily fiber needs, 3 g of protein and only 80 calories per cob. Keep with the theme of the meal by cooking ears on the grill. Remove husks and clean any threads off. Combine butter, garlic, salt and pepper in a small bowl and melt in the microwave for about 30 seconds. Place corn cobs on sheets of aluminum foil before topping with butter mixture. Wrap the corn in the foil and grill for 15 to 20 minutes. While not a typical southern barbecue custom, adding some extra fruits and vegetables to your meal will help you fill up, without filling out. Grill vegetable kabobs with olive oil, salt and pepper until grill marks are seared in but veggies are still somewhat crisp. For a light dessert idea, grill fresh peach or apricot halves, then drizzle with honey and top with light whipped cream. Serve your meal with agave sweetened lemonade or sweet tea with a slice of lemon.